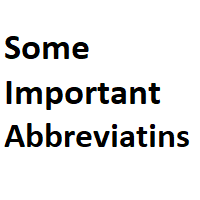 See below list of the important full form or acronyms. AIBD: Asia Pacific Institute for Broadcasting Development. AIMS: All Indian Institute of Medical Science. BRICS: Brazil Russia India China South Africa. CBSE: Central Board of Secondary Education. GST: Goods and Service Tax. HDFC: Housing Development Finance Corporation. FIFA: Federation International Football Association. ICICI: Industrial Credit and Investment Corporation. IEEFA: Institute for Energy Economics and Financial Analysis. IDBI: Industrial Development Bank of India. IIT: Indian Institute of Technology. IIIT: Indian Institute of Information Technology. IIM: Indian Institute of Management. IRDAI: Insurance Regulatory and Development Authority of India. NCDC: National Cooperative Development Corporation. NIIT: National Institute of Information Technology. NITI Ayog: National Institute for Transforming for India. ONGC: Oil and Natural Gas Corporation. OPEC: Organisation of the Petroleum Exporting Countries. RADAR: Radio Detection And Ranging. WIPO: World Intellectual Property Organisation. USA: United States of America.